The ever popular Peugeot 206 range has just got better with the introduction of the new 206 CC HDi and the 206 Zest 3. Starting at a competitive £7,995, the 1.1 litre Peugeot 206 Zest 3 is the entry model to the new Zest 3 range. Replacing the previous Zest models the Zest 3 benefits from a comprehensive standard specification which includes a fully colour coded exterior, a sports front bumper with integral fog lights and a dynamic Zagros interior trim in either blue/grey or red/grey depending on the exterior body colour. The Zest 3 is available as either a 3 door or 5 door model fitted with a 1.1 litre, or 1.4 litre petrol or a 1.4 litre HDi diesel engine. Air conditioning is available as an option on the 1.1 litre petrol models, but is fitted as standard on all 1.4 litre petrol and HDi diesel models. 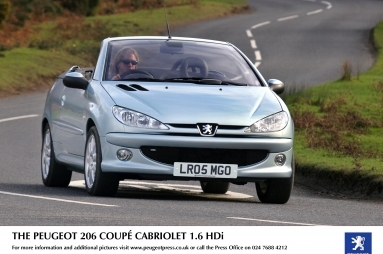 Since its introduction in 2001 the Peugeot 206 CC has won the hearts of more UK convertible buyers than any other model. It has remained the number one selling convertible car in the UK for the past three consecutive years. With new competitors entering the market the 206 CC range has been strengthened with the introduction of a new three model line up. The new entry model to the 206 CC range is the 206 CC Zest powered by a 1.6 litre petrol engine and with an on the road price of only £13,495. The second model in the range is the 206 CC Sport, priced from £13,995 on the road. This model builds on the comprehensive standard specification of the 206 CC Zest, with the standard fitment of 16" alloy wheels and air conditioning. It is available with either a 1.6 litre petrol engine or Peugeot’s class leading Euro IV 1.6 litre HDi diesel engine, fitted with a diesel particulate filter. The 206 CC Sport HDi 110 is priced at £14,695 on the road, only £700 more than the 1.6 litre petrol model. The 1.6 litre petrol engine can also be fitted with an optional 4 speed "Tiptronic" automatic gearbox and is priced at £14,995 on the road. The range topping model in the new 206 CC range is the 206 CC Allure. Building further on the standard specification of the 206 CC Sport, the Allure provides the richest standard specification ever on a 206 CC. The standard specification of the 206 CC Allure includes digital air conditioning with climate control, leather interior in a choice of black, red/black or grey, Thatcham class one alarm, JBL hi-fi, automatic headlights and windscreen wipers, front side airbags and aluminium interior detailing. Three engine options are available. A 1.6 or 2.0 litre petrol engine or the 1.6 litre HDi diesel engine. A 4 speed "Tiptronic" automatic gear option is available on the 1.6 litre petrol model only. 206 CC Allure prices start at £14,995 for the 1.6 litre petrol model, and rise to £15,695 for the identically priced 2.0 litre petrol and HDi models. With free insurance* available on all the new 206 models purchased between 1 April and 31 May, owning a new 206 CC could not be easier. * Free insurance available for buyers aged 25-80 for the GTi range & CC and 21-80 all other models (excluding S and Independence), not including Northern Ireland.